Apps are all about choice. And nowhere is choice more appealing than in the world of Web browsing. In the early days of smartphones, users had no choice but to use the browser that came installed with the operating system, but now we have multiple choices: This week saw the release of Mozilla's Firefox 4 for Mobile, and Opera's Mini 6 and Mobile 11. Both browsers look to expand on the bundled mobile browsers' functionality by adding easy-to-use features and social network sharing. Firefox 4 just launched on the desktop, so it makes sense that its mobile counterpart should appear in the Android Market, even if it's still a release candidate (Mozilla says the version will be updated to the final variant in the next few weeks). Not surprisingly, Firefox 4 brings many of the cool features of the desktop version downstream, including boomark and history syncing amongst devices, a variation on tabbed browsing, and the Awesome Bar. 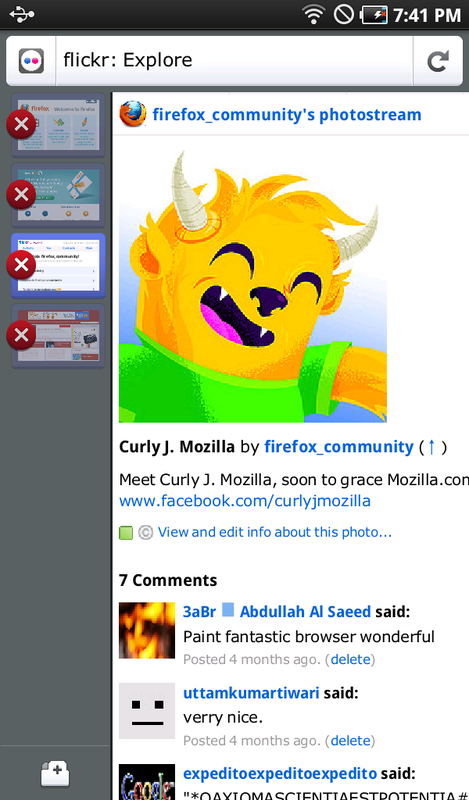 In use, the Firefox 4 for Mobile browser marks a huge usability improvement over the stock Android 2.x browser. The start page is customizable, and shows tabs of pages from a previous session. The Mobile browser also has the Awesome Bar, which you access once you tap the URL bar. The Awesome Bar learns as you browse, and will display your favorite pages based on the frequency you go to those pages, and how recently you've visited. The Awesome Bar also has some nifty built-in features and support for plug-ins. The huge bonus that I've waited a while to see on a mobile browser: The ability to save a Web page as a PDF, directly from the browser. That's a terrific boon for mobile travelers who might want to access content offline, when they have no Internet connection. You can also efficiently search within a page, add a search engine, and share a page via your social networks (Facebook, Twitter), as well as Gmail, text, and via Bluetooth. Through add-ons, you can save a page's HTML to a reading list, or use the Awesome Bar to send out your tweets. 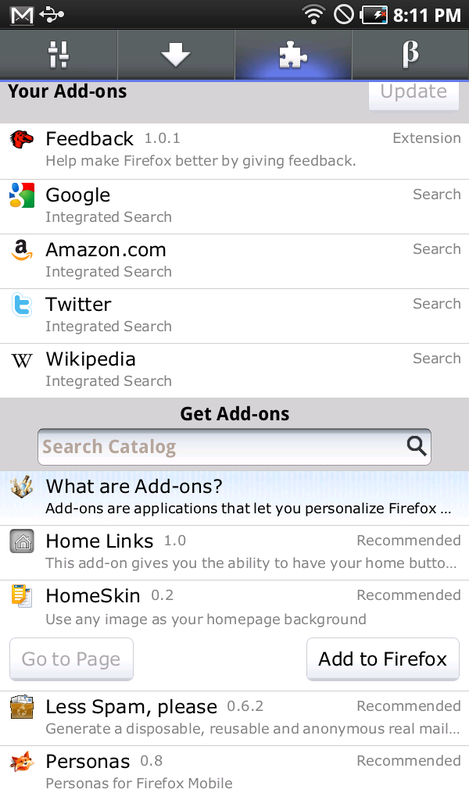 You swipe to the right to open a left panel and access thumbnails that represent your currently open windows (the Mobile version's take on tabbed browsing). Theoretically, you can have as many Windows open as you want; you're just constrained by your hardware's oomph...and, you'll have to scroll down among the open windows if you have more than one screen's length worth of windows open. I can see where this navigation style will be good on phone handsets, but this visual approach to tabs felt limiting: The icons are somewhat small to be able to distinguish among. The icons will be easier to handle, perhaps, on a tablet-but then again, this version of Firefox Mobile is not the one intended for tablets. And on the tablet, I prefer the actual tabbed interface of Google's current Honeycomb browser. According to Mozilla's Thomas Arend, principal product manager, the tablet-optimized version will be coming "very shortly", probably in the next release cycle due in a few months. From the main screen, you can swipe to the left to reveal the navigation, bookmarks, and browser settings in a pane that appears at right. This version adds the ability to zoom and pan on a page at the same time; and to double tap to zoom into a column or text block. The Firefox Sync capability lets you sync up bookmarks and usage history via the Web and a secure tunnel. Initiate on one device, then the other. The mobile will generate a secure 12-character code that you can enter on the first system to create the share. Your sync file can be stored with 256-bit AES encryption on Mozilla's servers, or companies can choose to store this info on their own servers. Opera also introduced new versions of its Mini and Mobile browsers. The Mini 6 works on Android, BlackBerry, and Symbian and Java smartphones. 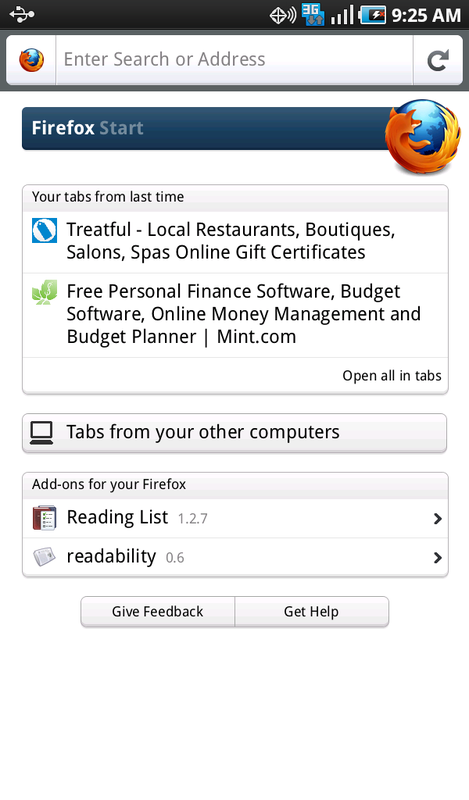 Mobile 11, the more full-featured browser, works with Android and Symbian. Opera's browsers can be used on iOS, via a workaround whereby the browser itself is hosted on the company's servers, an approach the company says actually improves performance on frequently accessed pages, since those pages can be cached remotely. Opera's updates are more modest, but both browsers now allow pinch-to-zoom, and both have a share button so you share a page via Facebook, Twitter, and other social networks.